A family favourite in this house! Served with brown rice and garden salad, it makes a healthy and tasty meal. Sage in the meatballs is the definite hero in this dish and my secret (now, not-so-secret) ingredient. See the notes below for including more vegetables. Place bread and sage into TM bowl and chop Speed 7 for 10 seconds. Place aside in a large bowl. Place onion and garlic and other herbs in TM bowl and chop on Speed 5 for 10 seconds. Tip out about ¼ of the onion mixture into the breadcrumbs. Add your mince to the breadcrumbs and mix well to incorporate (I use clean hands for this job). To the rest of the onions in the TM bowl, add a can of tomatoes, tomato paste, stock concentrate and wine. Cook for 15 minutes, Varoma, Speed 2. If it starts to bubble over, reduce temp to 100'. Whilst the sauce is cooking you can form the meatballs. I browned my meatballs quickly over a hotplate and I usually do this in the same dish I am going to bake them in, such as a flameproof/ovenproof dish (not the glass dish as shown). Pour the tomato sauce over the meatballs and give a shake so the sauce disperses. Bake 150' for 35 minutes in the oven. Meanwhile cook the brown rice in the Thermomix as per instructions in everyday cookbook, and prepare a salad (or steam veges in the last 8 minutes of the rice cooking). I grated some cheese in my TM bowl and sprinkled on top of the hot meatballs to let it melt. The recipe can be doubled to feed a crowd but cook the tomatos on 100’C to prevent spilling over. 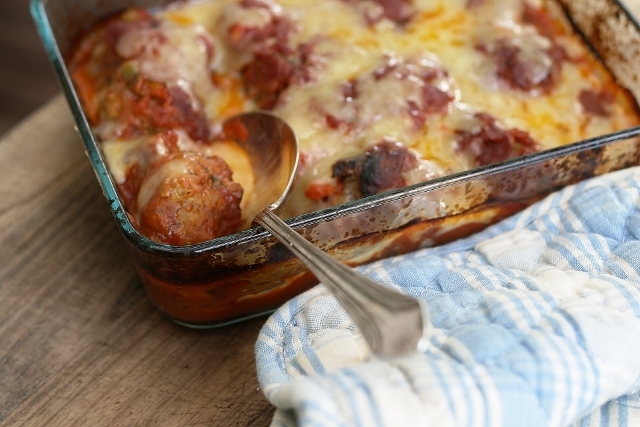 Meatballs can be steamed in the Varoma tray whilst cooking the tomato sauce. Cook sauce and meatballs for 25 minutes, on Varoma, Speed 2. To ensure the meatballs cook through make sure they aren’t too large. If you wish to include more vegetables in the dish you can add vegetables to the meatballs or the pasta sauce. I usually chop eggplant, zucchini and carrot on Speed 8 and add to the meatball mixture or add some spinach and capsicum to the pasta sauce (add to the onion mixture and chop on speed 5). Now you have the veges covered. Try using lamb mince spiced with ground cumin along with fresh corriander and mint for a more middle eastern flavoured dish. Serve with couscous. G'day Tamara! This is an ABSOLUTE winner with me, true! I added some spinach I had to use up and as visually I enjoy eating with my eyes, I easily and quickly browned the meatballs in my Flavorstone pans…no need for oil! Healthy! Can't WAIT to try making lamb meatballs! Thank you for answering my question re the veggies…just wasn't sure to chop them raw and put in the sauce…left them out this time as was unsure how the raw eggplant would go with the sauce…but is a great way of adding extra veggies! Look forward to my blog post re my loan of a Thermomix; trialling recipes for my food lifestyle coming soon giving you full credit for this WONDERFUL recipe and again Thank you too! Used my airfryer to brown the meatballs.